One cannot visit Cambodia without exploring the some of th oldest temples in Siem Reap. Some of the last remaining Angkorian temples and ruins. Cambodia, the name is enough to stir in you the emotion that you can associate with the ancient world. There is an uncanny aura surrounding that name, and we are taken back several centuries. Siem Reap, a capital of Siem Reap Province in northwestern Cambodia. A famous city that gets tourists drawn to see some of the most important temples in Siem Reap considering a lot of them are being reclaimed by nature. 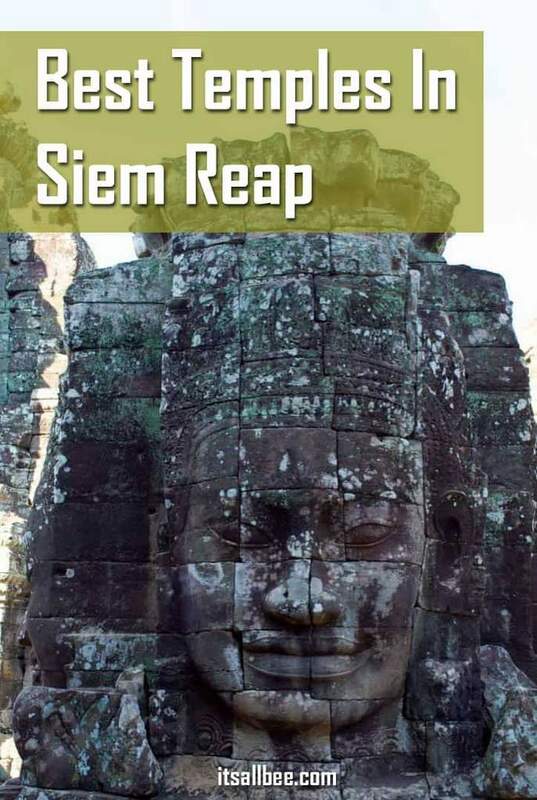 Below I take you through a list of temples in Siem Reap that are must-sees and the best way to see the temples in Siem Reap. With so many beautiful temples to explore makes you wonder just how many days should you spend in Siem Reap? We had a couple of days in Siem Reap for our first visit before returning again having visiting Malaysia. Reaching Siem Reap isn’t that difficult since Siem Reap International Airport has flights from across major Asian airports and beyond. 3 When Is The Best Time To Visit Siem Reap? One of the oldest evidence of Buddhism and Hinduism besides India can be found here. Angkor Wat temple and various other Hindu and Buddhist temples can be found within the Siem Reap. With mysticism surrounding every temple and stunning architecture dictating every column, you will want to take your time and explore every inch. There are so many times in Siem Reap but below are 5 of my favourite, Cambodia famous temples, as well as being the best temples in Siem Reap, you definitely won’t want to miss out having a temple tour of Siem Reap’s best Angkorian wonders. Though there are hundreds of temples dotting through the countryside still untouched, that you will find yourself trying to figure out how many temples are there. Many have now turned into Cambodian ruins due to lack of maintenance. The ones below are among the few that are still standing. These are also some of the oldest temples in Siem Reap. Perfect if additions to a 4 day itinerary of Siem Reap. or if you are embarking on exploring many of the beautiful places to visit in Cambodia. Built in the Khmer dynasty, Angkor Wat temple was commissioned by King Suryavarman. Though other temples back then were made for Lord Shiva, this Angkor Wat temple was made for Hindu God, Lord Vishnu. This temple is built on a sprawling stretch of land and the massive structure with the accurate detailing of bas-relief, it has become an icon of Cambodia. However, by the end of the 12th century, it became a Buddhist temple. It has withstood the test of time and soon became the UNESCO World Heritage site in 1992. A visit to this temple should be the first thing to do among must-see temples in Siem Reap. The temple of Angkor Wat draws in people from around the world for sunrises and sunset photography session. Spoiler alert on what to expect when visiting the temple of Angkor Wat. Bayon temple was one of my very favourite temples in Siem Reap as I managed to make a few visits while in visiting the city. King Jayavarman VII commissioned the construction of this stone temple. The unmistakable artwork of carving Buddha faces on the walls of this temple are absolutely fascinating. There are approximately 216 of these smiling faces of Avalokiteshvara that adorn the walls. There is a feeling of awe that comes along with it, and a trip to Bayon temple should definitely be on your must see temple to visit among Angkor Wat temples park. It is located in Angkor Thom and is yet another significant monument from the erstwhile Khmer Empire are just so unique and so different from the churches, cathedrals and places of worship you are accustomed to. The adventure and history-loving tourist, as well as Siem, Reap temples history lovers can seek a guided temple tour in Siem Reap the ancient ruins of the lost world(nearly) through the dark corridors of this temple. Much like many of the temples here, Bayon temple too had made the transition from being a Hindu temple to a Buddhist temple. However, do not miss on the walls around the temple that speak to you with tales and legends of the Khmer dynasty. One of Cambodia’s famous temples. Yes, the reference to a Hollywood adventure movie will surely come when exploring Ta Prohm temple, one of the most awe-inspiring temples in Siem Reap. One thing that makes it different from others is the fact that unlike other Cambodian temples, this one is literally enveloped by huge tree roots. The temple has a tree and overgrown creepers growing along its walls and yet, it seems like it has surrendered itself to nature. The temple was built in 1136 during the Rajavihara dynasty. Though now renovation works are underway, most of the places in this temple are out of access to the tourists, and you can still take a few snap and pose like Lara Croft in The Tomb Raider. One of the other important temples that must be on your trip to Siem Reap is the Preah Khan. There are similarities you will find in certain styles with Ta Prohm, but the fact that this served as a temporary residence to King Jayavarman VII says a lot. The details of art and architecture point in the work done and provide an insight into the kind of lifestyle the people had back then. There are Hindu Mythological tales etched into the walls and the lavish courtyard and corridors will certainly form a memorable part of your trip exploring Cambodian temples in Siem Reap. Another one of on the list of temples in Siem Reap that are just a must see is Banteay Srey. Equally impressive and architectural marvels by the name of Banteay Srey or Banteay Srei. Located near the hill of Phnom Dei, this sandstone temple of Lord Shiva is markedly different from the other Angkor temples you have checked out so far. There is a saying that it has such delicate artwork for the walls that it was possibly done by women only. To reach this temple, you will need to book a car, bike or tuk-tuk as its slightly further than the others but you also enjoy the serenity and opulence of this place of a whole with on a few people. There is no dearth of temples in Siem Reap because it was once the capital of the Khmer dynasty. So, while Siem Reap has modern metropolis life running alongside keeping up with its modernity, it has its trail of history leading back to the 12th century but you can also hit the beach only a few miles away, and watch the sun going down the horizon. Siem Reap definitely opened up your soul and eyes to a new world! I am so glad with got to return to Cambodia for a second trip of exploring as well as ringing in the new year in Siem Reap’s Pub Street. 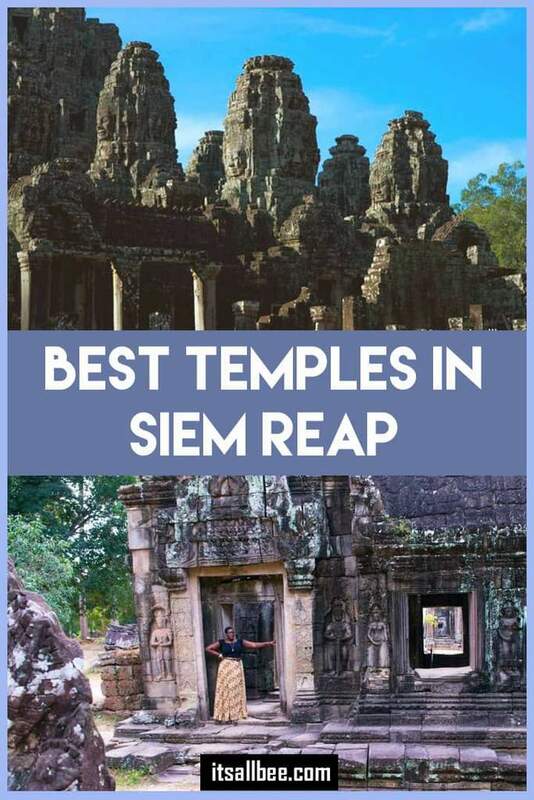 Other than these popular five temples in Siem Reap, there are other temples in Siem Reap also worth mentioning that you can check out drop in if you have time or eagerness. The temple of Ta Som, which is a smaller version of the Ta Prohm is another great option. You may also visit Thommanon temple, which was dedicated to Shiva and Vishnu. It is one of the temples featured as the UNESCO World Heritage spot, and so you might consider visiting it. When its comes to the best way to see the temples in Siem Reap, as there is a significant distance between them, you will find the some of the hotels in Siem Reap also offer bike hire, if you choose to explore that way independently. If you are looking at car rentals in Siem Reap for exploring temples, I would say don’t bother with that option as some of the roads are not that great and nor is signage in the city. Instead, my recommended options would be hiring a tuk-tuk and a driver. I believe it costs about $20 for the day or half day and the driver will drop you at a time and pick you up and take you to the next temple. When you buy your tickets for the temples you will buy a pass that is either 24 hours or 3 days, I believe they also offer a week pass option. This is by far the best way to see the temples are the hotel can help you arrange a tuk-tuk driver who can navigate around the temples in Angkor Wat national park without you having to know which roads to get there. Although I would say its better to have a plan of which temples you plan to visit and the best way to see them during this way your driver knows the best way to get around and which nearby temples might also be interesting to check out. We had our tuk-tuk driver for 3 days in Siem Reap which made exploring the temples a lot easier. Also, note that the temples are quite a distance from the main city hub that is Pub Street. So if you are hoping to do a sunrise at Angkor Wat temple, you will definitely have to prearrange your transport the day before as people sometimes set off at 3am and 4am just to get there and get a good spot for sunrise pictures of Angkor Wat. We visited Siem Reap in December through January, which is one of the dry months. We had great weather, the majority of days were dry. I would say November, December, January are the best times to visit as the weather is fairly stable. It’s warm and sometimes hot but not unbearably hot. You will still need to pack some repellent as there are still plenty of mosquitos. You really need only a couple of days in Siem Reap at best maybe a week to really explore. An ideal itinerary for 3 days and 2 nights in Siem Reap would involve exploring temples during the day and exploring Pub Street in the evening which has restaurants and markets. This is if you are short on time. Otherwise, I think at least 5 days at the very best so as to allow you to pace yourself and revisit some of the favourite temples in Siem Reap. To help you figure out which is the best hotel to stay in Siem Reap to find out which is the best location to stay in Siem Reap, I have a guide on where to stay in Siem Reap that features budget, mid-range and luxury hotels as well as tips on where to stay in the city to make the most of you exploring in Siem Reap. You managed to capture the true beauty of Siem Reap so elegantly! I will be recommending this post to any of my friends wishing to visit Cambodia. That’s awesome. Your friends are more than welcome to reach out with questions if the like. I will do my best to answer where I can. I love your pictures they really help visualise the beauty of Angkorian temples. With these temples, Siem Reap is indeed a heritage spot in the world. Even though these temples are built in ancient times, apart from its spiritual history its architecture really intrigues me, especially the Bayon temple, I can only imagine how the temple was erected alongside the gigantic tree. This is really a place to visit someday. Yep, Siem Reap temples are just a treat for the eyes and so much history too. Do people still worship in these temples or is it for tourist alone?